Diego "Chico" Corrales, who won titles in two weight classes and was involved in one of the most memorable fights in recent times, died in a motorcycle accident, his promoter said. Gary Shaw said Corrales, 29, was driving his motorcycle at a high rate of speed when he ran into the back of a car about 10 miles (16 kilometers) west of the Las Vegas Strip on Monday night. "He's laying there as we speak with a helmet on his head under a sheet," Shaw said. "It appears he was thrown a great distance." Shaw said Corrales, whose career had faltered in recent fights, had recently bought a racing motorcycle, which he was apparently riding at the time he was killed. "He fought recklessly and he lived recklessly," Shaw said. "That was his style." Las Vegas police spokesman Jose Montoya said the victim in the accident was wearing a helmet, and it was not known if drugs or alcohol was involved. "No tests have been done. We're still investigating," Montoya said. 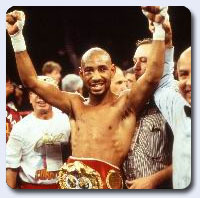 The lanky Corrales, who stood 5 feet 10Ѕ inches (1.79 meters) but fought most of his career at 130 pounds (59 kilograms), was a big puncher best known for getting up after two 10th-round knockdowns to stop Jose Luis Castillo in one of the most thrilling fights ever. The fight took place May 7, 2005, exactly two years from the night he died. It was named by the Boxing Writers Association of America and numerous boxing publications as the fight of the year. Corrales, though, was knocked out by Castillo in the rematch and lost a big payday when he failed to make weight for his next fight. He lost his last three fights, including his last fight on April 7 against Joshua Clottey in Springfield, Missouri. He had moved up two weight divisions to welterweight for that fight, but dropped a decision. Corrales, who was born in Sacramento, California, but lived in Las Vegas in recent years, won his first 33 fights and held a piece of the 130-pound title before he was stopped by Floyd Mayweather Jr. in a unification fight in January 2001. Corrales was sent to jail on a domestic abuse charge after that fight, and didn't fight again for two years. He came back to fight a trilogy against Joel Casamayor, losing two of the three fights, and split a pair of fights with Castillo. After failing to make weight and then losing in the ring to Casamayor in a lightweight fight last October, Corrales made the unusual step of moving up two weight classes to fight Clottey. He was knocked down in the ninth and tenth rounds and lost a unanimous decision. "He always cared about the fans and gave them their money's worth," Shaw said. "He was a true warrior. He was what boxing stood for, and what boxing is all about." A radioactive isotope one billion times older than the Universe!